Turbula - Culture - Book review: "Ghost Story"
With all due respect to Jim Butcher, he's crazy if he doesn't think the ending to "Changes" was a cliffhanger. At the close of "Changes," the 12th installment in the Dresden Files series (published last year), the hero, Chicago private eye and wizard Harry Dresden, is shot in the chest, the force of the bullet knocking him off his brother's boat and into Lake Michigan. 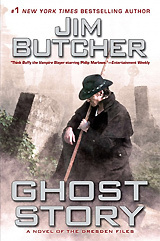 But the goofy argument that that's not a cliffhanger (contained in an author's note) is the only thing that doesn't ring true in Butcher's newest Dresden novel, "Ghost Story" (publishing Tuesday). Picking up where "Changes" left off, Dresden finds himself in the afterlife. And just as the appearance of a daughter he never knew he had presented him with life-altering decisions (no matter which option he chose), so does death. Of course, Dresden chooses to return to Chicago and solve his own murder  the alternative is to leave his allies and friends to fight the forces of evil on their own, and Dresden has never been one to walk away from a fight. On the other hand, after having decided to return to the battle, Dresden has to accept the fact that his role is a bit different now that his fist will float right through a living person's nose with little more than a tingle on his end and complete ignorance of the act on theirs. The obvious physical differences between being a living wizard and being a ghost give "Ghost Story" a bit of a different feel from earlier Dresden novels. Dresden is no longer a powerful force of nature, able to overpower his foes. There's a lot more thinking going on here, a lot more internal ruminating on Harry's part. But Butcher (who just spent several days at Comic-Con in San Diego) does a wonderful job of keeping Harry true to his own nature, even in death. A lot of familiar characters are still involved in Harry's ... existence, and there are a handful of new characters as memorable as the old faves. Within the world of the Dresden Files, the narrative is cohesive and logical. And there's another cliffhanger, to boot  with the promise of a 14th entry in the series still to come.